Join us for our webcast where Craig MacDonald and Felix Freund will provide an update on the European Corporate Bond Fund and provide their outlook for the months to come. 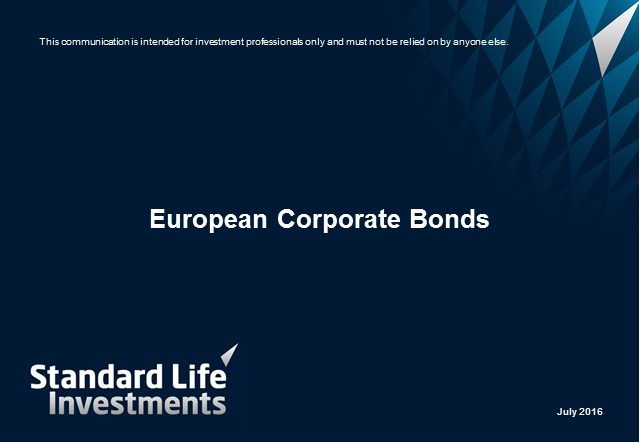 Join Portfolio Managers, Felix Freund and Josef Helmes, as they provide an update on the Standard Life Investments European Corporate Bond Fund and offer their outlook for the coming months. In the latest of our quarterly Global Credit webcasts Craig MacDonald, Head of Credit and lead portfolio manager on the Global Credit Fund will provide an update on the fund's performance and positioning, as well as outlining the key market themes for the quarter ahead. Is the integration of ESG material risks and opportunities becoming more standard in investment processes for private markets? If so, what does this look like? During the call, Adam will discuss our Global Absolute Return Strategies covering key themes within the portfolio and a summary of our current positions and outlook. You'll also have the opportunity to ask Adam questions during the webcast. Our Global Head of Multi-asset and Macro Investing, Guy Stern, will provide an overview of recent research by the team and their resulting market insights. He will also reference the positioning of our Global Absolute Return Strategies (GARS) portfolio and explain key changes that have been made recently. Please join us for the quarterly Global Credit webcast where Craig MacDonald, Head of Credit and lead portfolio manager on the Global Credit Fund will provide an update on the fund's performance and positioning, as well as outlining the key market themes for the quarter ahead. The products, information and other material contained on this website are only directed at institutional investors in Germany, Austria, Switzerland, Belgium, Luxembourg, Netherlands, Denmark, Greece, France, Italy, Spain, Portugal, Sweden, Norway and Finland.